You may view Facebook wall photos, profile photos on mouse hover only. You may save your time. You need not to click to enlarge the photo. You may view enlarged photo mouse hover only. To enjoy this facility you need to add extension / plugin in the browser. When you are logged into Facebook then take the mouse on photo and you will see the enlarged photo on hover only. GoPhoto is one of the best images zoom extension which zooms photos quickly. 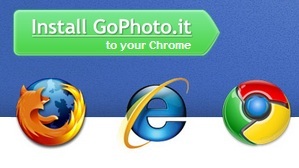 GoPhoto supports Internet Explorer, Firefox and Chrome browsers. 1. Open GoPhoto in your browser. 3. Click Add to Install the extension. 4. Extension has got added in your browser. 5. Now open Facebook and take mouse over on any wall image. This entry was posted in Facebook on November 25, 2012 by Yogesh Bajpai.